Border wall Mass was dramatic, but was anyone in D.C. listening? WASHINGTON (CNS) — The bishops who trekked through the desert, served dinner to deportees, celebrated Mass at the Mexican border and visited a morgue full of unidentified bodies found in the wilderness were intent on sampling and publicizing the harsh realities of what they repeatedly called the broken immigration system. Now comes the test of whether anyone in Washington got the message. News stories, photos and video of the March 31 and April 1 activities circled the world: showing bishops ducking under barbed wire amid stands of cactus and sticker bushes; pouring juice for weary migrants; and reaching between the slats of the border fence to bless Massgoers and distribute the Eucharist. Comparisons were made to Pope Francis’ visit last summer to the Italian island Lampedusa, where migrants who attempt to enter Europe illegally — and often die in the process — were memorialized. In Nogales, as the pope did in Lampedusa, the bishops warned against indifference to the plight of suffering people. 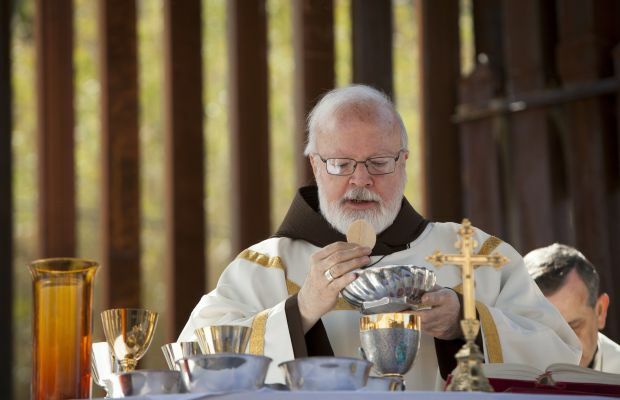 Cardinal Sean P. O’Malley of Boston, preaching during the Mass, ticked off statistics: 400 bodies found in the border region each year; 25,000 children who arrived in the U.S. last year unaccompanied by relatives; 30,000 people without criminal records held in immigration detention, at a cost of $2 billion annually; and more than 10 million people without legal immigration status living in fear of discovery, deportation and separation from their family members. “The system is broken and is causing untold suffering and an untenable waste of resources, human and material,” he said. In conversations with Catholic News Service and in comments during a news conference after the Mass, the bishops talked about how affecting it was to hear story after story of families separated by deportation. They ached with the migrants who related the physical, financial and emotional costs of trying to get into the United States in search of family reunification, jobs and a better life. At the news conference, 13-year-old Fatima Rojas walked onto the stage and asked the bishops to pick up the phone and call President Barack Obama on behalf of her sister, Rosy, in her sixth month of immigration detention in Eloy, Ariz.
“You can do it,” she pleaded, saying that Pope Francis had intervened with Obama for another girl. Jersey Vargas, 10, on a pilgrimage to Rome with people from the Archdiocese of Los Angeles, was able to personally plead with the pope in mid-March to speak to the president about her father, who was being held in immigration detention in Louisiana. A few days after Obama and Pope Francis met at the Vatican March 25, Mario Vargas was released on bond and allowed to reunite with his family in Los Angeles. It’s unclear whether there was any direct connection with the events at the Vatican. But someone believed there was. “I know you can call President Obama,” Fatima told the bishops, through tears. The bishops themselves wish they had the kind of clout Fatima thinks they do. The border events were part of a ramping up of the U.S. church’s efforts to persuade Congress to pass comprehensive immigration reform and, more immediately, to end deportation and detention policies that are dividing families. Whether their efforts resonate where it counts — in the House of Representatives, where immigration legislation hasn’t moved since the Senate passed a reform bill last June — remains to be seen. In an April 4 teleconference sponsored by immigration reform advocates, Kevin Appleby, director of migration and public affairs for the U.S. Conference of Catholic Bishops, said the border events underlined the urgency of dealing with the humanitarian costs of the immigration situation. “We went to (the border) to raise the human issue, the moral issue,” said Appleby. “We always talk about the economic, social and legal issues, but in the end, this is about 11 million human beings living in the shadows. “Immigration laws should protect human rights, not undermine them,” he added. “The U.S. bishops believe our current laws undermine them” by keeping families apart through detention and deportation. Rep. Luis Gutierrez, D-Ill., the most vocal congressional advocate for comprehensive reform, said in the teleconference that he’s optimistic that legislation can pass in the House before Congress recesses for the summer. If it doesn’t, he said, Obama has the legal authority to ease the threat of deportation for millions of people by executive order, using prosecutorial discretion. Meeting with the Congressional Hispanic Caucus and with immigration reform advocates in March, Obama said he was instructing Homeland Security Secretary Jeh Johnson to review options for just such steps. Nearly two years ago, Obama exerted prosecutorial discretion in creating Deferred Action for Childhood Arrivals, known as DACA, a path for young adults who came to the country as children to register with the government and be shielded temporarily from deportation. The Hispanic Caucus will formally present to Johnson next week their suggestions for possible executive actions, Gutierrez said. Gutierrez and others on the teleconference emphasized that their preference is to make permanent fixes, through legislation. But time is running out. The closer it is to this fall’s midterm elections, the less likely it is that immigration legislation will be allowed to come to a vote. One effort to get the Senate bill to the House floor is being shepherded by Minority Leader Nancy Pelosi, D-Calif., in the form of a discharge petition. With the signatures of 218 House members, a discharge petition can bring a bill that has languished to the floor without coming through a committee. In the meantime, Gutierrez said he’s rounding up Democratic support for a bill by Republican Rep. Jeff Denham of California that would provide permanent U.S. residency in exchange for military service to immigrants without legal status who came into the country as children. Known as the ENLIST Act, Denham is trying to include the legislation in National Defense Authorization Act as it is marked up in the Armed Services Committee.